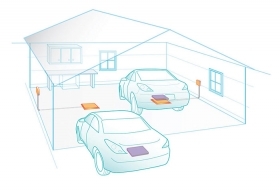 Delphi's working on a pad that would transfer power wirelessly to a car's receiver. Delphi Automotive has been cutting its umbilical cord to General Motors ever since the parts maker was spun off from the automaker in 1999. In 2005, sales to GM still represented half of Delphi's business. But today, CEO Rodney O'Neal says, 82 percent of Delphi's revenue comes from sales to automakers other than GM. Now Delphi wants to help electric vehicles cut the cord, too, by developing a wireless charging system for hybrid and electric vehicles. The system would allow a driver to park an electric or hybrid vehicle over a pad that transfers power wirelessly to a receiver on the automobile. The system can transfer more than 3,300 watts, enough to charge an electric car as fast as most residential plug-in chargers, Delphi says. It's being developed with WiTricity, a Boston area startup with ties to the Massachusetts Institute of Technology. Other suppliers, including startup Evatran, of San Jose, Calif., are developing wireless electronic-vehicle charging systems, too. O'Neal wouldn't say when he expects the wireless charging system to be ready.